How Do You Buy Shipping Containers Online? If you're not going to need the container for more than a year or two, it probably makes more sense to rent. 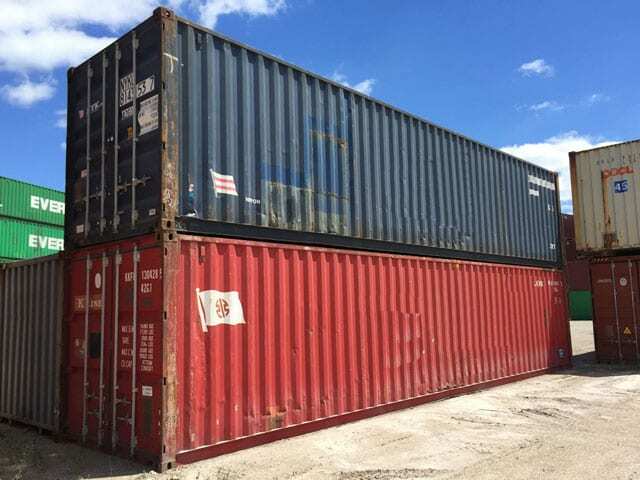 We offer 10', 20' and 40' container rentals (service area is 25 miles from the cities listed on this page). Fill out the form to order online. Delivery calculated at checkout by zip code. We're proud to offer full-scale 3D Models of 20', 40' and 40' High Cube shipping containers that can be viewed via Augmented Reality (AR). You can learn more about our Augmented Reality shipping container models by watching the video. And, if you have an iOS powered device (iPhone, iPad, etc.) that supports Augmented Reality, you can try them out on this page. What Happens When You Fill Out Those "Free Quote" Forms? Usually the websites that you see offering you "Free Quotes" or to "Instantly Compare Quotes" from multiple vendors are just lead generators. You might notice that most of the time when you call, nobody answers. That's because they don't actually sell containers... they just sell your information. The company that you gave your phone number and email to, sells the information as a lead to multiple companies. Sometimes it's a reputable company buying the lead, sometimes it's a less professional operation, sometimes it's a mix (depends on who is buying leads in your market). We don't believe you can talk anyone into a container they don't need... And when you contact us the person on the other end will just be focused on helping you, not closing the deal. Why Don't We Make You Call for a Shipping Container Quote? We know what a hassle it can be to call for a quote, or how annoying it can be to fill out a form and be bombarded with salespeople from different companies. Unlike the big guys, our shipping container prices are posted online. Why do we do this when other companies won't? Simple, we know our prices are fair, and well below what you'd see with our large corporate competitors. Western Container Sales will get you a fair price for a shipping or storage container sourced directly from global intermodal equipment providers, pulled from their inventories at your nearest intermodal depot. Because the containers were recently moving cargo, we know they won't leak and we guarantee it. Check out our current shipping container prices (please note they do change with inventory levels). We're proud to be members of the Intermodal Association of North America, the National Portable Storage Association, and Platinum Certified with the Green Business Bureau. We leverage our relationships with global intermodal companies and help them sell containers throughout North America. The containers we source are available for cargo use up to the day we buy them for our customers. Because of how we buy our containers we can guarantee the equipment for one year from date of purchase. We also offer a 30-day money-back guarantee for every container purchased (less trucking charges, visit this page for more details). We want to make the process of buying a shipping container a simple one. Please feel free to contact us with any questions, we're always happy to help.